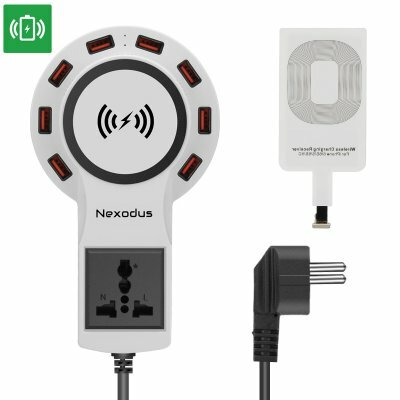 Successfully Added Nexodus LifeLine 8 Port USB Charging Stations - iPhone Reciver, Qi Charging Pad, 12Amp, USB Type C Lead (White) to your Shopping Cart. The multi port Nexodus charging station is your one stop hub for charging all of your electronics and is now available with a Qi wireless charging pad suitable for use with iPhone 5/5c/5c/6 and 6 Plus models. The wireless receiver that comes with this Qi charger plugs directly into your iPhone's charging port and is slim enough to slip in most cases keeping it tucked out of the way. As well as Qi charging this multi port charger has 8 USB ports and comes with a USB type C cable giving you a fully future proof charging dock for cameras, phones, tablets, music plays, speakers and many more electronics and gadgets. This lets you charge a wide range of devices without the need for cables. Having a total of 8 ports that together can support up to 12 Amps of charging the Nexodus lifeline lets you charge a huge amount of electronics simultaneously without and only requires one wall socket.